Plan to set up your display 15 minutes before the session is to begin. The Annual Meeting Program will indicate the poster board number to which you have been assigned. The presenting author should be available throughout the session and be prepared to have his or her display removed no more than 10 minutes after the end of the session. Your material should be mounted on poster board or cardboard. Avoid the use of heavy board, which may be difficult to keep in position on the poster surface. If it seems appropriate, it can be helpful to mount conceptually related portions of your display on backgrounds of the same color, as this will help viewers scan the display efficiently. The poster should be as self-explanatory as possible so that your main job is to supplement the information it contains. The poster format provides a mechanism for in depth discussion of your research, but this is possible only if the display includes enough information to have a sketch pad and drawing materials available to help you make you points. It is also strongly recommended that the author have available a number of copies (about 20) of the full paper to distribute to interested parties. The poster surface is made of cork and measures 4' high x 6' wide. While some fasteners will be available, AERA cannot guarantee that there will be enough for all participants. It is up to the participants to make sure that they bring their own supplies with them. A sign containing the paper title and the authors' name and affiliations should appear at the top of the poster. Keep in mind that all your text and illustrations will be viewed from a distance of more than three feet. All lettering should be at least 2/3" high, 1" for more important information, and preferably in bold font. Figures and tables should be kept as simple as possible, so that viewers can readily take away the main message. A brief large type heading of no more than one or two lines should be provided above each illustration, with more detailed information added in smaller type beneath the illustration. A copy of your abstract (300 words or less) should be placed in the upper left portion of the poster, with a conclusion in the lower right hand corner. Although there is considerable room for flexibility, it is often useful to have panels indicating the aims of the research, the methods and subjects involved, and the experimental tasks. Another panel might highlight the important results, with a few panels being used to present the main points in tables or figures. When working on the arrangement of your display on the poster, be aware that it is preferable to align materials in columns rather than rows. Audience members who are scanning posters have a much easier task if they can proceed from the left to right rather than having to skip around in the display. 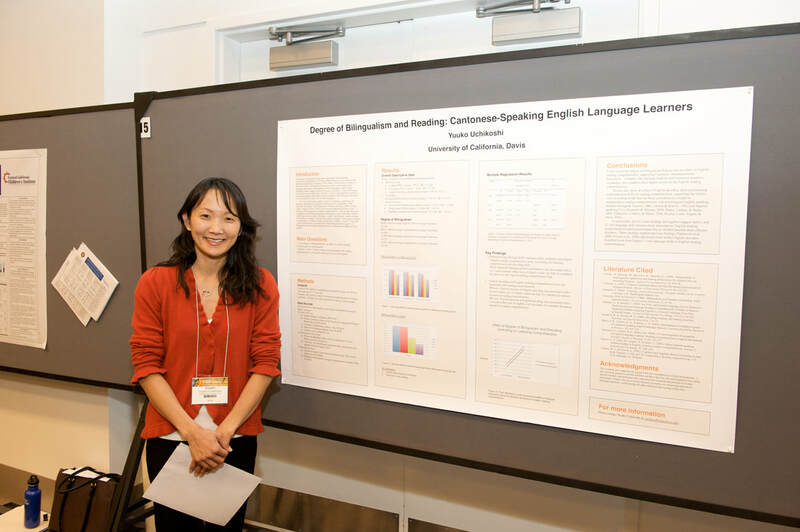 For poster presenters wishing to show additional materials, such as video clips from your laptop computer, we will provide shared tables between posters to support your computer. Please come prepared for computers to have a full battery charge, as the poster displays are not near any electrical outlets.